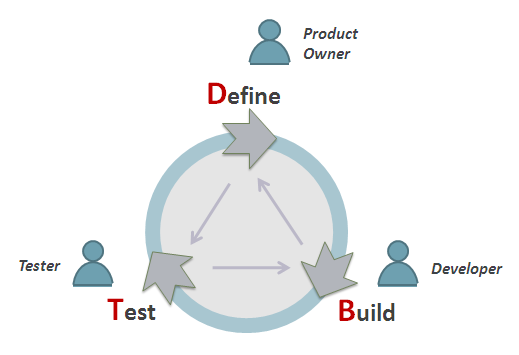 Define-Build-Test (or DBT) is one of the seven agile practices that scale (see "Scaling Software Agility" by Leffingwell). And even though organizing successful agile development at scale is a sum of a whole number of techniques and approaches, DBT paradigm is something to start with as it is the most important step to efficient value creation. Let’s consider the anatomy of a DBT effort. 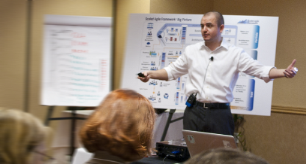 Product owner defines a story for the team so that it is understandable enough to be estimated and so the team could commit to deliver the story within a sprint. A developer writes the code that implements the functionality of the user story and tester performs the verification. These are the three logical steps that each DBT team performs. Although there is a number of important nuances relevant to successful deployment of this practice. Let’s consider them in more detail. The role overlap is the evidence of effective self-organization within a DBT team, it fosters creative thinking and innovation. If the team fails to deliver full user story within a sprint, they deliver zero user value. This way we avoid the “snowball effect” of batches which helps keeping the outcome within much more predictable time boundaries. Also a “vertical slice” of a user story gives the product owner immediate opportunity to evaluate her assumptions. Developers and testers also drive out most of the risks this way, because this tiny slice goes thru the entire system vertically and makes all the system layers “work together” to perform a valuable function. We have selected just one of the examples of splitting story into two DBT cycles based on “Main functionality – Everything else” approach. But there can be many other ways too. Also, there can be more than just two such cycles. Effective product owner works with the team at the level of a DBT cycle, which supports effective just-in-time requirements elaboration. Now, if the team fails to deliver the entire scope of a story they can still finalize their current cut of the story (the output of the currently finished DBT cycle) and, if the product owner accepts that, count it as user value (say 3 points out of a 5-point story). With this approach teams understand their velocity better as well as their burn-down chart becomes more reliable sprint tracking tool. DBT formations. Even though we call an individual agile team a DBT team emphasizing that they can define and implement their each backlog item, the implementation of each user story is not precisely done by the whole team. 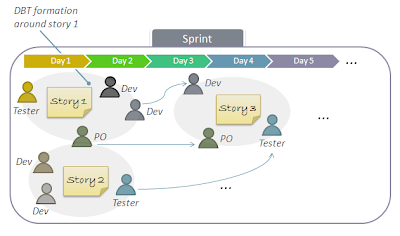 Instead, DBT formations self-organize around each user story. Indeed, team members rotate across different areas of the codebase each time they organize into DBT formations and thus exchange information very efficiently within the formation itself as well as with the rest of the team. Also they keep the code clean because each time they encounter someone else's code that already starts smelling, they just improve the design so that a) they could effectively work with it and b) other DBT formations could add new functionality faster in the near future. The quality of the system functionality maintains high because DBT formation starts catching defects in early cycles which minimizes required rework associated with bug fixing during the implementation. I am looking your upcoming post, really unique information you have shared here, keep your blog as updated. It was clear to understand the concept of dbt framework, thanks admin. Useful post.A debt of gratitude is in order for sharing this post. A lot of chances are accessible in IT parts. Programming testing has an incredible breadth in today's IT industry. Begin your profession in testing field. Taking preparing will help you to accomplish a particular position. IT'S AN INTERESTING BLOG WITH A GOOD INFORMATION. THANKS FOR SHARING. Interesting blog, Thanks for saring. Very interesting and useful blog. Thanks for sharing. Really Excellent information. Thank you. Nice blog has been shared by you. it will Thank you for sharing this blog.be really helpful to many peoples who are all working under the technology. Wonderful blog! I really appreciate your work. Keep us updated by sharing more such posts. Looking forward to learn more from you. My favorite casino! purely play casino games I recommend to everyone!!! The engine does not slow down. I did not observe any breaks in the connection. Won $ 2200. Brought the winnings to no problem. Very beautiful, pleasant, comfortable casino. Very nice voice acting. Honesty control. In short .. all zashib""